With schools closing for Easter, you may be wondering how to keep your youngsters occupied so you don’t end up tearing your hair out each day. Finding activities to keep them happy and engaged without spending a fortune can sometimes be a challenge, but here are some suggestions for Easter activities that won’t break the bank. Decorating eggs can be done in several ways, depending on whether or not you want to eat your finished creations! Firstly, you will need to cook your eggs by boiling them for 10 minutes. If you plan to eat them, plunge them into cold water immediately after cooking to avoid getting the green ring around the yolk that can be a bit off-putting. Spoonful has got some fantastic ideas for decorating eggs, and these could be a springboard to let your child’s imagination run wild. Traditionally, decorated eggs are often marbled, and again, there are different ways to achieve a wonderful finish. Made from Pinterest gives a step-by-step guide to marbling eggs using shaving foam, or for edible marbling, take a look at Narcissism is Necessary. CLICK HERE FOR MORE GREAT IDEAS! 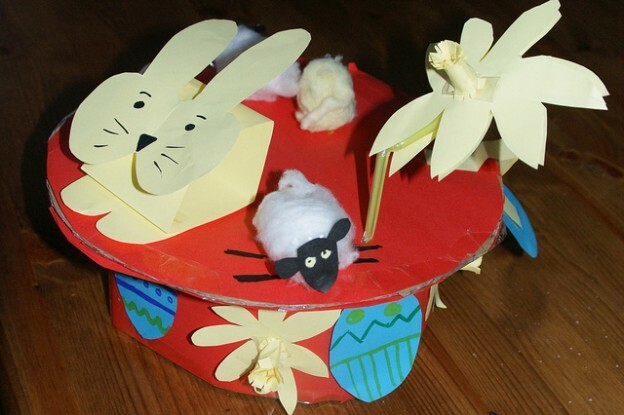 This entry was posted in Children's activities, Families and Parenting and tagged decorated eggs, Easter activities for children, Easter bonnet, Easter cooking for children, Easter cooking for kids, Easter craft, Easter craft for kids, Easter egg, Easter egg hunt, Easter printables, Easter. Easter activities for kids, marbled eggs on 5th April 2014 by emanneh. Don’t miss out on our latest post! It’s National Baking Week! Ready, Steady, Bake!